How much does a water tank cost? Although it sounds like a pretty simple question, it can get a little complicated as water tanks can be made from a wide range of different materials and range in size from 100 litres all the way to well over 1 million litres. For a quick overview, we’ve put together the table below which will give you a ballpark number for different tank sizes. It’s important to note, however, that prices do vary based on a range of different factors. We’ll cover some of these later on. ** Actual price will vary depending on State and location of installation. For an accurate price, talk to one of our sales advisors or request a quote online. As you can tell from the table, the biggest factor affecting the price of your water tank is its size. For smaller tanks, Polyethylene (food grade plastic) is the most common material used. It’s light and can be made relatively cheaply. For tanks between 1,000 Litres and 17,000 Litres, a poly tank is your best choice and will set you back between $500 and $4,000. Things get a bit more complicated as tank sizes increase from here and this is where steel tanks become the more logical and common choice, particularly in high fire risk zones. Read more about managing your water tank in a bushfire situation here. This is because for tanks up to around 17,000 litres, the price per litre of poly water tanks decreases as they get larger, as you might expect. At around this range, however, the scales tip back and the cost of poly tanks actually begin to rise again, making steel the better choice. The main reason for this is the logistics and complications of transporting tanks. Poly tanks in excess of 24,500 litres are considered oversize loads and this places an increasing cost on delivery. Also, Poly tanks are made in moulds and it becomes impractical and expensive to manufacture moulds over a certain size. Steel tanks, on the other hand are transported on a flat-pack pallet and are fully assembled on-site, which makes them easy to get to even the most remote and inaccessible sites. With this in mind, water tanks from around 17,000 litres will most commonly be of a steel construction, with prices starting from around $4,200. What about other tank materials like concrete or stainless steel? Concrete tanks are still quite popular for underground use or in fire zones, they do generally cost more, however, and they are prone to cracking and can leach a lime taste into the water. Stainless steel tanks are often very expensive (particularly for larger water tank sizes) and can be unreliable, depending on the quality of the steel used in the welded joins. 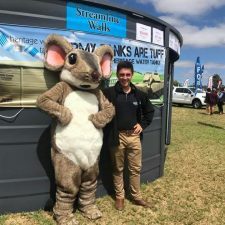 If you need some help deciding what material is best for your tank, you can talk to one of our sales advisors on 1800 115 552 or read our article on the benefits of a steel water tank. Some tanks may be cheaper upfront, but lose out on durability, so are more expensive in the long run. Plastic tanks also succumb to the radiant heat of fires and cannot withstand any kind of fire front. Steel is very fire resistant and will almost always outlive a concrete or poly tank. Even if the upfront price exceeds a cheaper alternative it’s important to look at the overall lifespan of the tank. If you’re going to be paying for another water tank in 10 years, it’s probably better to invest the extra money for something that will last for over 20 years. Heritage Water Tanks offer a 20-year Pro-Rata conditional warranty. This means that we will replace the cost or repair of any of your water tank parts covered under the Warranty Terms and Conditions. Most Poly Tank companies only offer a 10 or 15-year warranty at best. You should also be careful of ‘Too good to be true,’ product warranties that other steel water tank companies are currently offering. Whilst a 30 year Warranty might sound good, often the conditions state that the value of the repair or replacement of the components is based on the price that as paid at the point of sale, therefore in 30 years time, your Warranty will not be based on the current value of the item being replaced and will be virtually worthless. For tanks of the same size, there are still a number of factors which affect prices. For example, if you’re considering a Heritage Water Tank, the price can vary depending on which colour you select. The cheapest option is ZINCALUME and prices go up if you choose one of our nine COLORBOND options. If you have a colour in mind that is outside of this range, you can ask us to quote you a price for a Powder-coated colour to match in with your preferred colour scheme. It’s also important to note that prices vary by state because of remoteness and delivery costs. Delivery is usually free, however, if you live within 100km of one of our local Distributors which are located in all states in Australia. In order to get a clearer idea of what you’ll be paying for a quality water tank, you’ll need to request a proper quote from one of our Sales Advisors. You can request a free quote right here!